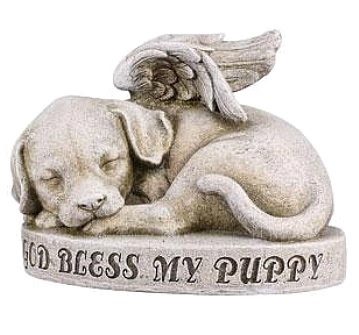 One of our adorable memorial angel dog gifts includes this sleeping angel dog figurine made of resin. It comes beautifully crafted with wings outstretched, enraptured in a peaceful sleep. Dimensions: 7.5" x 10" x 7"
Did you know that Labrador Retrievers never seem to get enough of their food? Because of their tendency to plead for food at the dinner tables, they are able to get extras to chow down. All this is said to affect the dog in the long term as Labradors can suffer from obesity and diabetes. As a result, dog owners should sometimes turn away when their dog seeks more food. Instead, they should get plenty of exercise and a diet that works for their frame.